The Bruce Peninsula Sportsmen’s Association was started in 1962 and became a chartered club in 1965. The first directors were Irvin Sutter, Terry Walker, Ewart Taylor, William Sam, Murdoch McKenzie and John Craig. The present club house was built on 5 acres of land purchased on North Acres Road in Wiarton. North of Wiarton, Bruce Road 13 turn left. Go to Northarces Rd, turn left. Our drive way is just off the highway. Since the club started fish stocking more than 50 years ago, Bruce Peninsula Sportsmen members have planted more then 5-million rainbow and brown trout to enhance the sports fishery in Georgian Bay. When she visited the BPSA hatchery in 2008, former Ontario Natural Resources Minister Donna Cansfield commented on what our club has accomplished over the years. Cansfield said “running a fish hatchery is not easy… I’m …very impressed with the volunteers and the work they do, their commitment, and the thoroughness with which they do it”. Today BPSA operates the longest running volunteer/community fish-stocking program in Ontario. Our association started in 1962 and became a chartered club in 1965. Original directors were Terry Walker, Ewart Taylor, William Sam, Murdoch McKenzie and John Craig. A clubhouse was built near Wiarton, on the Bruce Peninsula. Raising rainbow trout for the sports fishery started in 1968. Initially volunteers built a spring-fed pond for the baby fish at the Wiarton Golf Club. After a few years, concrete raceways were installed on the club property, but there were issues with low oxygen levels and the system being open to the weather. Members decided to experiment with incubation boxes on Colpoy’s Creek and Gleason Brook on Colpoy’s Bay. Fry were then transferred from the in-creek incubation boxes to concrete tanks to grow into yearlings before being released. That system had its challenges due to uncontrolled conditions and vandalism on the incubation boxes. A decision was made to build an incubation system on the club property with an improved aeration set up and spring-fed water. Club members built a new hatchery in 2002 with volunteer labour and with financial help from many individuals, and community and provincial organizations. They included the Town of Wiarton, Wiarton Rotary Club and the Ontario Federation of Anglers and Hunters. The BPSA Hatchery can handle 200,000 eggs per year, with both rainbow and brown trout raised in the facility. Rainbow and brown trout are stocked into Gleason and Colpoy’s creeks as yearlings. From the start, the BPSA mandate was preservation and enhancement of fish and wildlife. Besides the hatchery, that mandate is brought to life in activities such as winter deer feeding, and involvement in the Rankin Resource Group that works on habitat improvement on the Rankin River system and other Grey-Bruce waters. 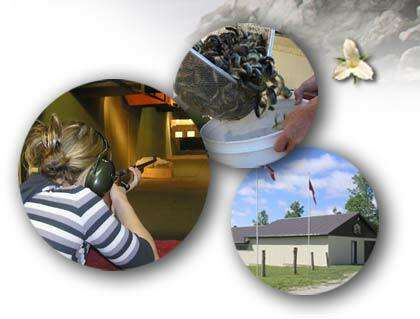 The BPSA facilities west of Wiarton feature our hatchery and clubhouse building, a fishing pond, indoor handgun and .22 range, an archery range and 3-D archery range. Many club activities are centered on these facilities, including, a children’s fishing derby, annual Family Day activities, a fishing day for Community Living clients, youth archery and handgun groups. The club also hosts numerous social functions throughout the year, including a members and guests fishing derby and our annual fund raising barbecue. The BPSA youth program is a more recent addition to the club, designed to ensure there are anglers, hunters and conservationists in the future. There are separate archery and .22 firearm safety and target shooting youth groups as well as other activities that guide young people to the world of outdoors recreation. Since our club began, BPSA has been dedicated to getting young people outdoors to appreciate the Canadian heritage pursuits of recreational fishing, hunting and trapping. We also teach them that hunters and anglers are historically known to have been the best conservationists. The re-introduction of wild turkeys is an example of what can happen when strong willed outdoors folks are determined to bring back a species that, years ago, was wiped out by over-harvesting. BPSA lobbied for the installation of Deer Crossing and Turtle Crossing signs that were installed beside regional roads to help protect motorists and wildlife. BPSA donates time staffing the Wiarton Fall Fair and the Rotary Village fair, and provides an annual bursary to a Georgian College student. BPSA volunteers commit many hours to Youth Firearm Safety and Shooting, which happens every other week for eight weeks. This adds up to over 384 hours a year by volunteer range masters. Membership in the club now sits at more than 200. BPSA depends on dozens of sponsors each year. It also depends on special partnerships to get its work done. BPSA works closely with the Ontario Ministry of Natural Resources and Forestry, The OFAH Ontario Community Hatchery Program, the Sydenham Sportsmen’s Association, the Lake Huron Fishing Club, the Ontario Steelheaders, the Barrow Bay Anglers and many other groups and individuals. Tourism studies have concluded that the fish stocking done by BPSA has helped pump at least $17-million into the Grey-Bruce economy. Province-wide, recreational fishing pumps $2.5 billion a year into the Ontario economy. Our sports fishing attracts anglers from the U.S. and across Ontario. Thousands of people drive many hours to get here to enjoy world-class sports fishing. Thousands of retirees have moved to Grey-Bruce attracted here by its recreational fishing opportunities. And the bonus is, that any fish caught in our waters, such as rainbow and brown trout, are safe to eat.